The words translated “eternal”, “eternity” or “forever” in traditional Bible translations do not, in fact, mean eternity or eternal in the sense of endless duration, but “age” or “age-enduring”. An important element in the argument for biblical universalism is that the words translated “eternal”, “eternity” or “forever” in traditional translations do not, in fact, mean eternity or eternal in the sense of endless duration, but “age” or “age-enduring”. This new scholarly study explains in detail how this works. 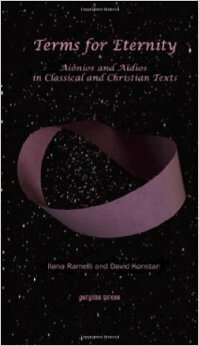 Find the book here: Terms for Eternity: Aiônios and Aïdios in Classical and Christian Texts.